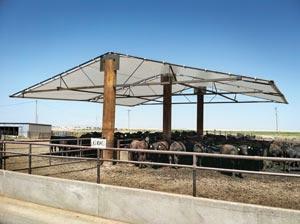 Accu-Steel Fabric-Covered Building Solutions introduces the Cattle Cabana livestock shade structure — a structure for all livestock producers that is proven to reduce heat stress and improve overall animal health. The 50-foot-wide structure with a center-post design is ideal for fence line or feed apron applications. A durable, HL13 fabric cover deflects heat and filters natural light to cattle, while edge ventilation maximizes airflow. The Cattle Cabana structure is designed for permanent, year-round use. Veterinarians and livestock consultants alike concur that minimizing cattle exposure to direct sun and extreme heat — while providing adequate ventilation — reduces herd heat stress and improves overall health. Feed efficiency is also enhanced when cattle are kept cool and calm. As a result, feedlot operators are looking to a variety of structural fabrications in an effort to create areas of reduced temperature and enhanced shade and ventilation, especially in geographies where extreme summer heat and minimal natural cover vegetation are the norms. Among the many exclusive engineering features that enhance the overall strength and effectiveness of the Cattle Cabana structure is a series of four cables extending from the center of each bay to all corners — a design element that helps break up and inhibit the “wave-type” motion often created by extreme wind gusts. The permanent steel-frame, center-post design — exclusive to the Cattle Cabana structure — ensures maximum strength and durability on a minimal footprint, allowing for easy and efficient equipment maneuverability. The Accu-Steel Cattle Cabana structure stands 50 feet wide with 24-foot wide individual fabric panels; a size configuration that creates a side area of shade for livestock while providing a 14-foot equipment clearance. The innovative HL13 cover fabric with HYDRA-LOC™ technology — the premium fabric found on all Accu-Steel fabric-covered buildings —is created with interwoven high-density polyethylene coated with low-density polyethylene. The result is a highly durable material that is both UV durable and waterproof, unlike typical shade cloth which allows rain entry and deteriorates with sun exposure. In addition to deflecting damaging sun rays, shedding rain, and allowing natural sunlight to filter through the cover, Accu-Steel offers an exclusive, 10-year factory warranty on HL13 fabric covers. Accu-Steel, Inc. manufactures steel-framed, fabric-covered buildings ranging in clear span widths from 30 ft. to 188 ft. with no limitation in length. Accu-Steel also manufactures a rigid steel structure with a fabric cover, which can be customized to any size or shape. Fabric-covered buildings are used for multiple applications, including: salt storage, sand storage, grain storage, fertilizer warehousing, commercial warehousing, composting, soil and mulch storage, recycling/solid waste transfer stations, mining buildings, equipment storage and repair facilities, water treatment facilities, indoor sports facilities, oil drilling shelters, military shelters, aircraft hangars and more. In addition to these general storage buildings, Accu-Steel manufactures highly specialized buildings specific to production cattle feeding, including the Crossover, which combines the strongest features from rigid-steel and fabric-covered structures. Accu-Steel was founded in 2000 and is headquartered in Templeton, Iowa.